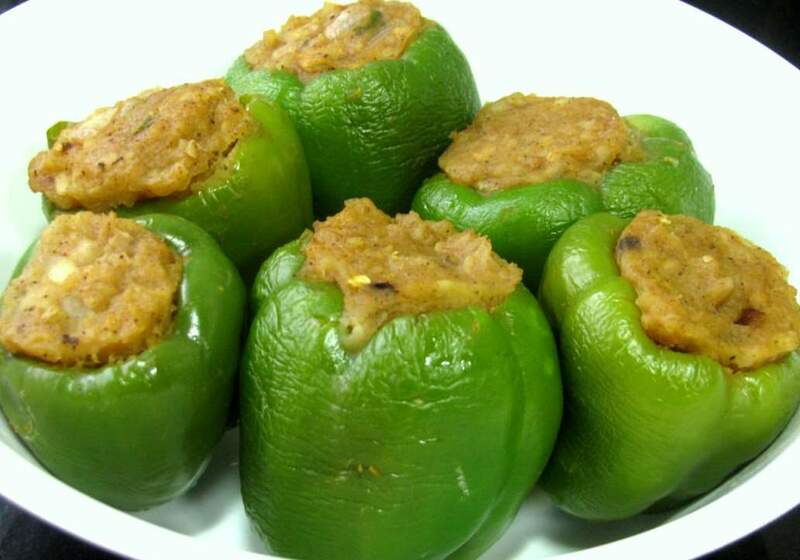 Stuffed capsicum is prepared from boiled potato, cottage cheese, with spices. It is quick and easy as well as a delicious dish. first, cut capsicums on the top side remove all seeds put side, mash the potatoes and put aside.Heat 2tbsp oil put cumin seed then cumin seed starts cracking then put onion saute2-3 minute after that you add all spices, saute one minute more.Add potatoes and crumbled cheese, mix well and saute 2-3 minutes more.Turn off the heat.Stuffing masala is ready. Stuff the bell pepper(capsicum) with stuffing masala.Heat1-2tbso oil and cook the bell pepper on low flame,10-20minutes. (If you want to cook capsicum in a microwave, preheat ovento450F., Grease a baking dish with little oil.Cook 15-20 minutes).Serve with nan, paratha.